With the nation awash in the lingering effects of war and recession, it’s boomtime for nostalgia in the cultural world. “The Artist” and “Hugo,” two films that romance the very earliest days of cinema, won big at this year’s Academy Awards on Sunday. And here in Chicago, recent publication launches give credence to the notion that there’s no time like the past to seek the future of print media. Couple that with the concurrent demise of the Chicago News Cooperative, an attempt to develop a new model for creating journalism, and we’ll soon be firing up those old linotype machines. The two new undertakings—the rebirth of The Chicagoan magazine, from the creator of the now-defunct Stop Smiling magazine, and Printers Row, a new literary weekly from the Chicago Tribune—fall under the influence of Dave Eggers, a onetime local who turned bestselling riches from his novel, “A Heartbreaking Work of Staggering Genius,” into a mini-empire of publishing enterprises known for creating outstanding literary works that often combine clever ideas with a highbrow smirk and a lush, retro design. His McSweeney’s literary journal created “San Francisco Panorama,” a one-off homage to the heyday of the newspaper that admittedly was not anywhere near economic viability but led daily journalists across the nation, beleaguered by the accelerating demise of their livelihood, to champion its quality and creativity and to begin to ask, “What if?” The Chicago Tribune was rumored to be formulating a plan to launch some kind of upscale Sunday newspaper inspired by “Panorama” but shelved it. 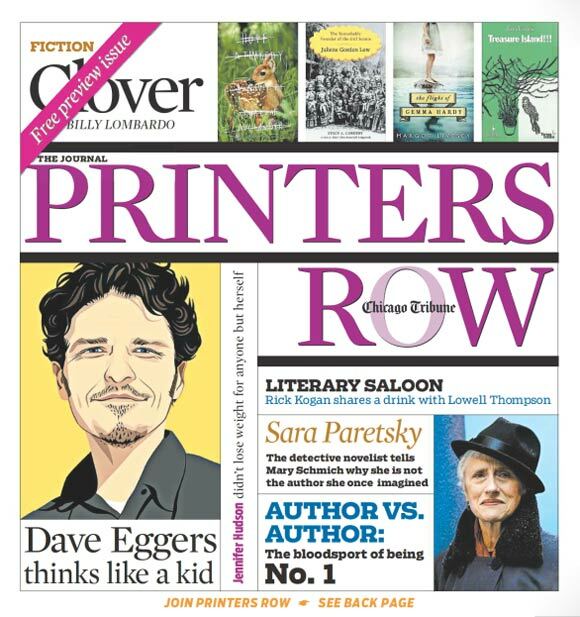 Instead, Printers Row was launched with a large front-page illustration of Eggers on its first issue and a design that gently recalls the influence of the McSweeney’s braintrust. Though The Chicagoan’s DNA is more diffuse, it too is banking on combining its retro charm with a contemporary mix of narrative and imagery in hopes of transcending the struggles of publications that founder J.C. Gabel cites in his opening editor’s letter as his inspiration, the likes of The Paris Review and Oxford American. Like anyone who makes a living putting ink on paper, I’ve been thinking a fair bit about the future of print these last few years. I may eat these very words a few years hence (it won’t be the first time I’ve chewed on paper), but I am not an end-of-print doomsdayer. I do, however, believe we’re close to the end of much print. My expectation is that we’ll see a decidedly more discriminating consumer, endangering products of marginal quality or utility, and one that values print publications almost in a fetishistic manner, that is as “objects” with characteristics unique to the medium. (Skeptics: Please explain the resurgence of vinyl in the music business, which now shows signs of outliving the CD, the product that drove it to its near-extinction.) By this measure, The Chicagoan is shrewdly executed. A book as thick as a fashion magazine, albeit without any ads, printed on heavy paper with a striking cover and elegant typography, it is designed to divide its time between your bedstand and coffeetable. The richness continues inside, with exquisite, classical design and rich photography and illustration. Of course, this luxury comes at a price—$19.95 per issue—and a semiannual frequency that affords the editors time for the meticulous editing and art direction the project demands. Though Gabel’s still a relative young’un, he’s always been out of time in the media world. 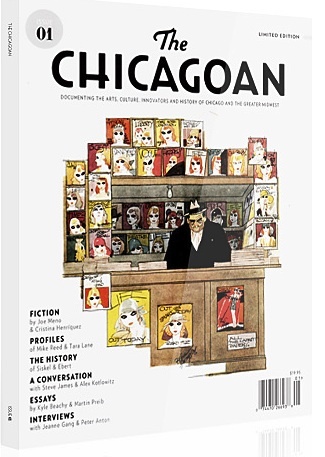 His Stop Smiling consciously paid tribute in form and substance to the great days of New Journalism in the sixties and the early seventies, and The Chicagoan takes it up a notch, with a debut cover illustrated not by a contemporary but rather a 1929 drawing of a newsstand by Russell Patterson. The Chicagoan is reviving the dying ideal of the newsstand with its own pop-up version, borrowing currency from the recent food-truck fad. The biggest challenge facing print media these days is not one of declining audience, which the self-defeating pundits might lead you to believe, but rather a breakdown of the advertising model that has sustained media for the last century or so. Not surprisingly, neither publication is sleeping in that bed; The Chicagoan does not even accept advertising. The vogue in media startups these last few years has been to go the nonprofit route. In spite of the sustained existence of public broadcasting on television and radio, it has not fared too well, at least in Chicago, with text-centric endeavors, the aforementioned Chicago News Cooperative being its latest casualty. Nevertheless, The Chicagoan is throwing in with the nonprofits, though with a more consumer-centric approach than the others. That is, it is asking its audience to pay much of the freight (not unlike member pledge drives on public broadcasting) by ponying up a healthy chunk of change for the magazine as well as becoming “members” of The Chicagoan, which will bring access to events and a digital monthly nonfiction story each month, along with the magazine, for a tidy sum of $99. Though Tribune Company falls into the category of not-intentionally-nonprofit and is accepting ads in Printers Row, editor Gerould Kern makes no bones about the need for readers to pay full freight. “A number of newspapers, including the Chicago Tribune, once offered stand-alone books sections,” he wrote in the Tribune recently. “They were distributed to the entire readership, including those who were passionate about books and those who were not. Traditionally there isn’t much advertising in these sections, so the cost became unsustainable. Most of these sections disappeared.” Coincidentally, Printers Row is also charging about a Benjamin ($99/year) and includes “member benefits” that include limited complimentary events access. My sense is that pricing is the Achilles’ heel of this otherwise-commendable project. Where The Chicagoan offers a la carte pricing—you can buy a single issue if you want—and delivers significant incremental product in the form of monthly stories and events (Gabel has a strong reputation as a literary impresario), and you have the karmic comfort of supporting a nonprofit to boot, if Printers Row falters, price will bear much of the blame. I have little doubt that the thing costs $99 a year to produce, nor do I think folks would not, in fact, pay that for a proven product, but the structure of their offer is fundamentally misguided. Not only is it about double the cost of a subscription to The New Yorker magazine, but it violates a practice that newspapers long ago mastered: don’t tell us what we’re paying a year, just sell us on the short term—$1.99 a week, say—and add it automatically to our bill or charge it to our credit cards. Most of us will pay and stay, and the trial decision will be a no-brainer. They do this all the time with the Tribune—my current subscription was based on an offer of Sundays only for ninety-nine cents a week, with Wednesday through Friday thrown in for another penny. They’ve since easily increased my price without notice, because it just bills to a credit card and I know that I can cancel any time. Years later, I’m still with them.